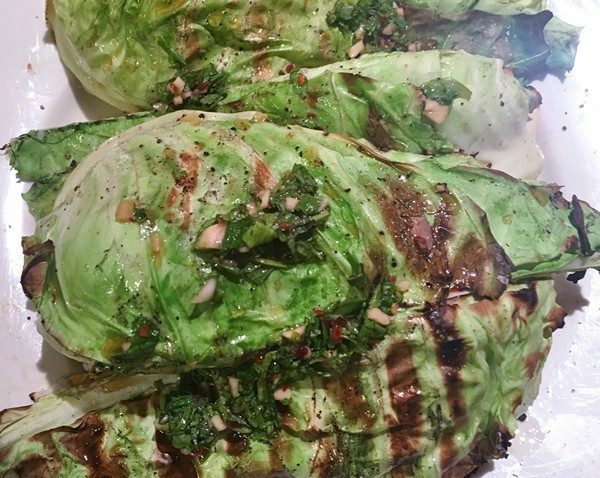 Cabbage might not be the first thing you’d think of to pop on the grill. Cabbage on the grill is great! The Accidental Locavore first heard of it last year at a CSA pick-up. Grilling makes the cabbage sweet and tender. And it makes it summery, rather than a sad reminder of St. Patrick’s Day. This recipe from Serious Eats sends it to Asia with the addition of a Thai-style dressing. Combine 2 tablespoons lime juice, all of the fish sauce, sugar, and garlic in a small microwaveable bowl. Microwave on high heat until steaming hot, about 20 seconds. Add chili flakes. Stir until sugar is dissolved. Allow to cool, then stir in remaining lime juice and herbs. Taste and add pepper flakes and fish sauce as needed. Set aside. 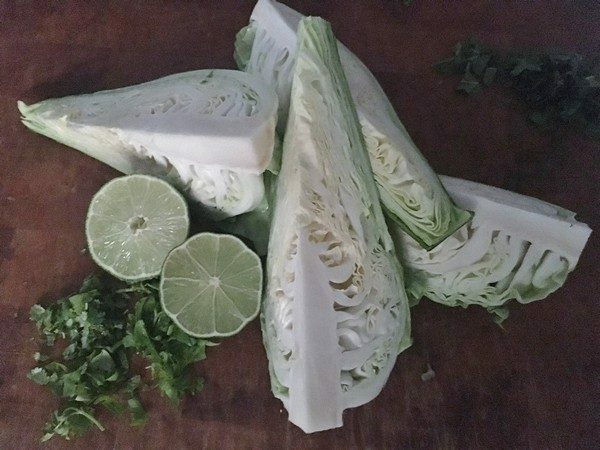 Place cabbage wedges directly over hot side of grill. Cook, covered, until well charred on first side, about 3 minutes. 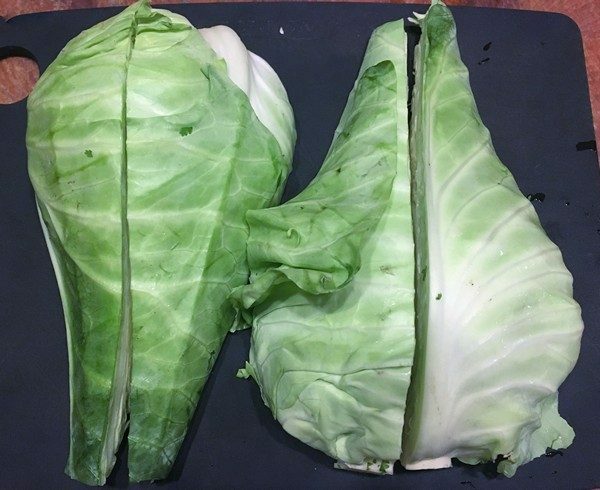 Flip cabbage, cover, and cook until charred on second side, another 3 minutes. Flip wedges to third side, cover, and cook until well charred, another 3 minutes. Transfer cabbage to cooler side of grill, cover, and continue cooking until mostly tender but still crunchy in center, about 5 minutes longer. Transfer cabbage to a large bowl and toss with olive oil, salt, and pepper. Transfer to a serving platter. Drizzle with sauce, serve and enjoy! My verdict: Grilled cabbage is really a great thing! This recipe should inspire you to try grilling wedges and dressing them with the classic wedge salad dressings like blue cheese and bacon, or turning it into grilled coleslaw (note to self…). As with anything containing fish sauce, go easy at first, you can always add more later. If you’re apartment bound, a grill pan on high heat will work fine, just turn it down to medium heat once the cabbage is charred. And if you’re like my brother and a charcoal purist, that works as well as gas (probably better). It makes it sweeter. I just tried smoking some for coleslaw and it really brought out the sweetness of the cabbage! Never in a million years would I have thought that grilled cabbage would be tasty! But I guess I’ll try it.